S.A.M. Emerald Ball a Huge Success! 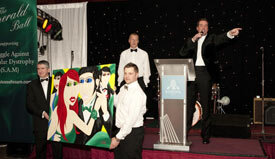 On 14th March 2009 the Europa Hotel played host to one of the newest, biggest and most exciting black tie events on the NI social calendar. The Emerald Ball, hosted by actor James Nesbitt and television personality Emma-Louise Johnston got off to a fabulous start with a champagne reception. Guests mingled in the Europa's long gallery to the sounds of the hauntingly beautiful Nua Band, whose eclectic mix of Irish folk music fused with an upbeat modern tone gave a nod to the event's Irish theme. The excitement relating to the event was palpable. The Europa Ballroom was stunningly transformed for the evening by Sarah B Designs, with shimmering light curtains and swathes of material, giving the event a sumptuous and luxurious feel. During the starter course Irish dancers provided background entertainment, and after a delicious 5 course gala dinner swing singer Martin John wove his way amongst the guests, wooing the ladies with romantic favourites from Sinatra, Deano, Bobby Darin and Nat King Cole. Jimmy and Emma-Louise then took to the stage to commence the serious business of the evening. They emotionally relayed Sam's story to the assembled guests, and Emma-Louise reviewed the charity's first year, highlighting some of the fundraising events which have so far helped us to raise money. Our promotional video introduced Sam and other young sufferers of the disease and there was barely a dry eye in the room. James Nesbitt made an heart-felt appeal to guests to dig deep for a worthy cause, and the auction was a huge success, with amazing prizes including a specially commissioned Jason Millar printing, kindly donated by Quantum Images, and a fitted kitchen donated by Cabra Kitchens of Lisburn helping to raise a substantial sum for the charity. The auctioneer for the evening was Peter Johnston of Wilsons Auctions. Following the ballot, the ladies in the audience were invited to the stage where each person select a gift box from prestigious Belfast jeweller Fred J. Malcolm. Moved by the charity's plight, Malcolms had commissioned a unique Emerald and Diamond Art Deco Style pendant containing a single octagon cut emerald of 1.00ct surrounded by two floating frames of brilliant cut diamonds, totaling 0.45ct. The stunning pendant, mounted in 18ct white gold with a retail value of over £2,200, was secreted in one of the jewellery boxes, and when Emma-Louise instructed the ladies to open the boxes the delighted winner was invited on stage. Otis and the Elevators then took to the stage, and the dancefloor was crammed to capacity for the rest of the evening and the high-heels and bow-ties were tossed aside as guests danced the night away to the Blues Brothers classics. The Emerald Ball helped us raise an amazing £60,000. This will now enable us to fund the setting up of a vital International Patient Registry for sufferers of CMD, including a DNA database for the scientific community to draw from. We have also committed to invite tenders for the first Struggle Against Muscular Dystrophy Translational Research Grant by the end of August 2009, which will give us real hope of finding a treatment for our children before time runs out.